When I had my first baby, I thought I was the queen of competent diaper-bag packing. Okay, so maybe I didn’t know if my baby was getting enough milk with each feeding. And I never quite figured out how to get her to fall asleep and stay asleep. But I sure had those diaper bag essentials packed and ready to go. I also only had one baby and very little parenting experience. Funny how things change, right? When I got pregnant with baby number two, I quickly realized that two hands and a cute diaper bag aren’t quite enough to survive daily outings with two small children in diapers. Sleepy toddlers, wobbly newborns, bulky car seats, and loaded diaper bags. It’s seriously so much stuff. 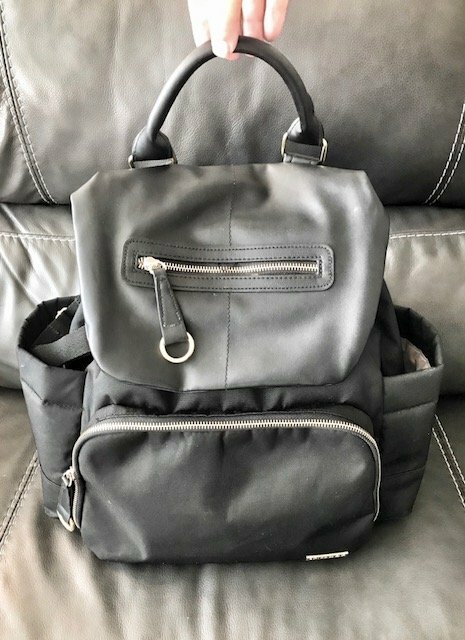 If you’ve got a second baby on the way, or more than one baby in diapers today, then you NEED to make sure you have everything from this list of my diaper bag essentials. We keep it super simple and functional around here (no fluffy stuff). Everything you need is linked up below and can be shipped right to your door. Pretty cool, right? This article contains affiliate links. You can read my full affiliate disclosure here. And without further ado, here is my list of diaper bag essentials for two babies under two. If you’ve got more than one small child, you need to have a sturdy, functional, versatile backpack-style diaper bag. And this diaper bag is probably up there among the best. It’s spacious, stylish, and allows you to have two free hands to manage your babies. It’s quite an investment in my opinion ($99.00 as of today), but it’s soooo worth it. Keep a small travel-case of wipes with just enough to get you through the daily trips. Diaper bags get heavy you guys, and there is no need to lug around gigantic containers of diapers and wipes. You might need a few wipes for diaper changes and a few wipes to clean up sticky messes, but not much more than that. Just the essentials, now. Remember that. I always have one blanket in my diaper bag and an extra one in the car. These large swaddle blankets are good for keeping baby warm, covering the car seat, covering up while breastfeeding, cleaning up slobber and spit up, or lying baby down on the floor. I don’t think I’ve ever left the house without a swaddle blanket since the day I had my first baby. It’s definitely one of the big diaper bag essentials. It is likely that your baby will have a blowout during those early days or destroy their outfit before you make it home. So, every diaper bag should have one change of clothes for your baby, even if it’s just a simple onesie or sleeper. I keep a change of clothes for my toddler in the back of the car, but not in the diaper bag. I’ve never actually had to use it, but it’s there, just in case. My new baby can’t quite grip things yet, but if your baby has a favorite toy, bring it along in the diaper bag! My toddler loves books, so we bring one along for those moments that we have to sit and wait somewhere. We never do the phone/tablet stuff yet, our babies are too small and I’d prefer to let them look at books, tell me stories, or just be bored. My dad would seriously laugh at me if he knew that I hauled around snacks and sippy cups for my toddler. When we were growing up, we were lucky if we found a lukewarm bottle of water on the dashboard of my dad’s pickup truck. And now, the snacks and sippy cups! Sorry Dad, but healthy snacks are absolute life savers during long car rides with my toddler. I just pack up her own little storage container with grapes, grilled chicken, crackers etc. If we’re going to be out all day, then I bring a little cooler with an ice pack, but most of the time, we can just throw these snacks into our diaper bag and go. It might get a little messy in the car, but I don’t care one bit! That’s what vacuums are for. By now, the baby’s portion of the “diaper bag essentials” list is pretty much covered. Don’t forget your wallet. Thankfully, the front pocket of my Chelsea diaper bag is the perfect size for my wallet and phone. I’m a big fan and ambassador for DIFF eyewear. They stand for a good cause, and they’re so stylish and sturdy. 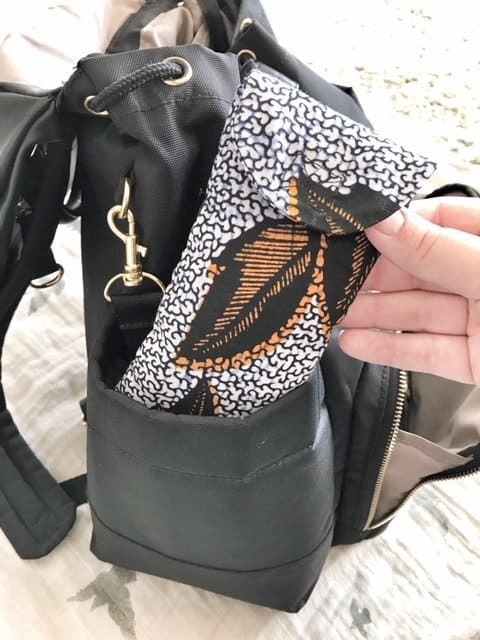 I have a lovely Kitenge pouch/case to protect my sunnies, and I keep them tucked into the outer side pocket of my diaper bag (see pictures). Use my link and get $10 off your first pair. For every purchase, they also give a pair of reading glasses to someone in need, so you can’t beat that. I keep my phone tucked into the front pocket of my diaper bag. Easy access and safe storage = awesome in my opinion. You should always keep a small pack of diapers, wipes, a change of clothes for everyone, and a first-aid kit in the back of your car. This allows you to lighten up your diaper bag and still be prepared for anything that comes your way during your outing. Keep your bag simple and functional. Even if you’re going to be out all day with your two small babes, you still don’t need a ton of stuff. Just think of your own childhood. Did you have a bunch of games, toys, food, and extra stuff with you when your parents took you to the grocery store or out for errands? Probably not. I’m all about efficiency and being prepared, but I still think simple is best. Bring the diaper bag essentials and leave everything else at home. Also, if you feed your baby formula, then you’ll need to add a bottle and formula to your bag. There is room, I promise! My kiddos are exclusively breastfed, so I don’t typically add these things to my list of essentials, but the principle is the same. Keep it simple, and add what you absolutely need. Okay, so I’m probably forgetting a few of the occasional extras that we bring along, but for the most part, this is what you’ll find in our diaper bag on the daily. Two babies under two is a lot of work, but it doesn’t have to be hard work. We can simplify, organize, and enjoy (almost) all of it. Start here. Simplify your diaper bag and your daily outings. And be sure to print out my diaper bag essentials checklist and use it as a starting point for your adventures! Now tell me, what are your diaper bag essentials? What does your baby or toddler insist on bringing? Share in the comments! Bless you, for managing two babies under 2. I have a niece that will be two in February. I get her every weekend, and that’s enough for me to handle, so I couldn’t imagine two full-time. Mamas always manage though. Maybe I will when I’m a mom, but until then, bless you and those others who do what they do. Nieces and nephews are so wonderful, especially because you get to give them back to mom and dad when you’re done with them haha! Thank you so much, you’re right, we just figure it out and do it, even if it’s hard sometimes. Have a wonderful weekend. I could just hug you for including a first aid kit! They’re inexpensive and no one ever regrets having one. All your other suggestions are spot on, too. If you keep the spare clothes in a freezer bag, then you have a pretty decent containment system when your baby or toddler gets extra messy. I have actually had to use my first aid kit twice haha, so I always recommend having it handy! And the freezer bag is brilliant. I usually just have poopy diapers rolling around the trunk until we get to a trash can! Gonna follow your tip and put the extras in a ziplock baggy.